Wisdom is a mental factor, meaning it is part of our functioning mind. It is a mental factor which looks at some thing, or some idea, and gets to know its nature, its attributes, and any other characteristics. In other words, it analyzes things. Its purpose is to counteract doubt. There are two types of wisdom: conventional wisdom and higher wisdom. Conventional wisdom is about being clever, cunning, making good decisions. Shakyamuni Buddha said that what we need is a higher wisdom, a sound philosophy for life. This means that we need, in the first place, a wisdom which distinguishes what brings happiness, and what does not. Secondly we need a wisdom which shows us the actual nature of things, their being empty of existing from their own side. What brings happiness? 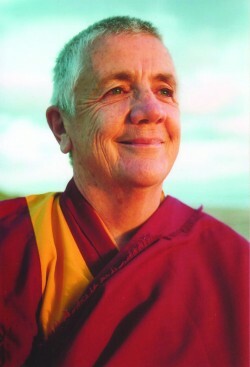 We begin to see that it comes from understanding that ordinary life, samsara, is undermined by chronic dissatisfaction. At the same time, it is possible to achieve something better – nirvana – which is free from this dissatisfaction. We begin to develop renunciation, wanting nirvana. So we begin to investigate what it is that brings nirvana. We begin to see that we need more time, so a good rebirth will help. We start to understand how looking at death teaches us how to live life.